The Bairactar OA sireline is the oldest active sireline in the world. It came to Europe when Bairactar OA 1813 was imported to Weil in 1817. He was desertbred of a Saklawi line and he became the foundation sire of Weil. The royal stud of Weil was founded by Wilhelm I, the king of Würtemberg. Beside Bairactar OA, many valuable horses were imported from the desert to Weil. Some of them left lines that exist today, for example the mare family of Murana I, the oldest mare line in the world. He was 157 cm high and with large eyes, dryness and refinement he was a very good-looking horse, albeit with a rather straight profile. These traits can still be seen in some of his modern descendants. 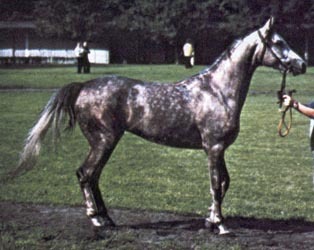 Even though he was used heavily at Weil this sireline remained scarce as a paternal line, although he left numerous broodmares. This tendency is often seen in the stallions of this line, the great sires leaving a large number of mares and only one or two sons to continue the line. Bairactar OA sired a few sons used at stud, but only one, Amurath 1829 out of Sady III, continued the line. The full brother of Amurath 1829, Selim, was also used and left some mares. Longevity is another trait of this line, Bairactar OA was put down when he was 26 years old and his descendant Amurath 1881 "Weil" was put down at 30. The skeleton of Bairactar OA is exhibited at the Institute for animal breeding in Stuttgart-Hohenheim. 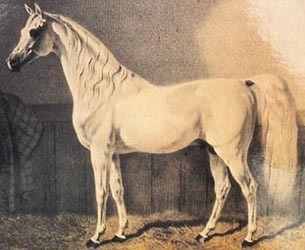 Amurath 1829 featured a close resemblance of his sire, also in the way that he left few stallions. The stallion that was responsible for continuing the line was Amurath 1829 son Tajar 1851 out of Geyran III. 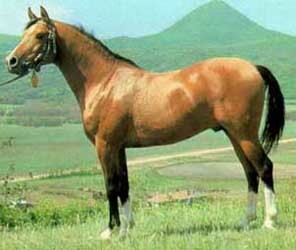 He in turn sired Tajar 1862 out of Daria VI, the sire of the third Tajar, born in 1873 out of Obeja. 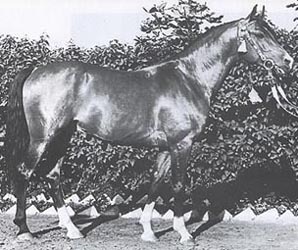 In 1881 one of the greatest sires in the world was born. This was Amurath 1881 by Tajar 1873 out of Koheil III, given the "surname" Weil as an honour. He resembled his fabulous forefather to a great degree, which was no surprise since he carried 14 lines to Bairactar OA. Sadly, he also marked the end of this line at Weil. He was sold because the current director of Weil did not wish to continue the close line- and inbreeding and used outcross stallions instead. Amurath 1881 went to Radautz (Radauti in romanian, Radowce in polish) where he was used chiefly as a halfbreed sire. Many distinguished Hannoverian horses carries his blood and he founded a sireline in that breed (it has died out as a sireline today). Again facing extinction, the line rose from the ashes through Amurath 1881 Weil's son 35 Amurath II 1907 out of the desertbred mare Fatme OA. Amurath II was exported to Poland to the stud Breniow, owned by Teresa Raciborska. This stud had a very romantic history. Teresa Raciborska, neé Wodzicka, was born a countess and her suitor Franciszek Raciborski was considered an unsuitable match. However, the two was in love and finally eloped, the former cavalry captain carrying her of on his horse. Sharing the love of the arabian horse, they built their stud from Weil and Babolna lines. The stud was destroyed during World War II and Franciszek Raciborski was killed. As it had been before, Amurath II sired only one son to continue the line, the grey Amurath Sahib 1932. 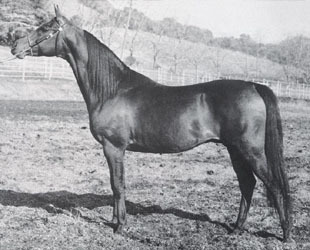 He was the only horse from Breniow to survive World War II since he had been taken to Janow Podlaski to be used as a sire. 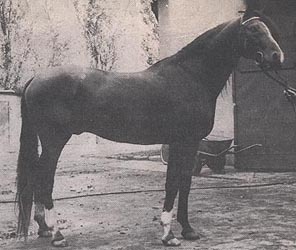 The dam of Amurath Sahib, Sahiba (the first Oaks and Derby winner), brought more Weil blood as she was by Nana Sahib I, a Weil stallion and a paternal grandson of Amurath 1881 Weil. Donka, Sahiba's dam, was from Babolna. Through his sire Amurath Sahib got 14 lines from Bairactar OA and from his dam 21, totalling 35 lines to his illustrious ancestor. 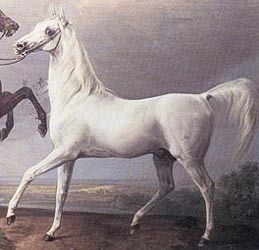 Amurath Sahib was ridden by the director to be, Andrzej Krysztalowicz, when he reached Dresden and saw the destruction of the stallions from Janow. 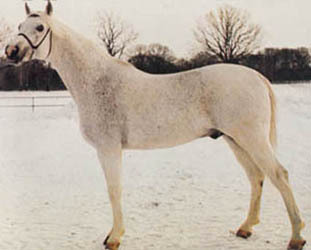 When the polish breeding program was continued in its German exile, Amurath Sahib was one of the chief stallions used. He was put especially to mares who had less than perfect legs and bone structure. 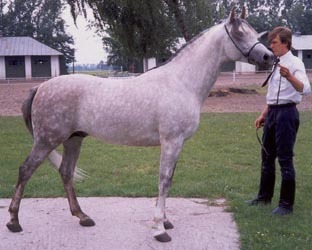 The first stallion is Bairactar OA himself. 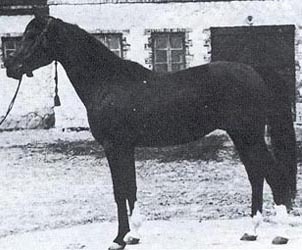 Beside Amurath 1829 he sired 37 mares and six stallions, among them Selim 1928 (a full brother to Amurath 1829) and Mazud 1838. 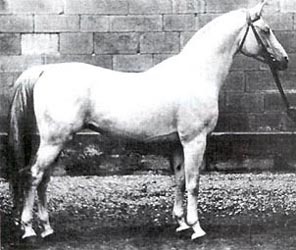 Among the mares were Geyran II 1829 and Wanda I 1930, whom both are found in the pedigree of Amurath 1881. Amurath 1829 sired stallions Tajar 1851, Amurath 1855 (who sired Amurath Bairactar 1867, exp to Babolna were he sired two mares) Bournu 1849 and Chaban 1844. Bournu 1849 was the sire of Seglavi 1864 who sired the famed mares Sabal 1872, Sabine 1872 and Selma V 1871 (maternal granddam of Amurath 1881). The daughter of Geyran II 1829, appropriately named Geyran III, was the dam of Tajar 1851. He sired Tajar (born in 1862) no 2 to continue the line as well as the mares Kobi 1860 and Goa IV 1866. The second Tajar sired Tajar no 3 in 1873. The son from Tajar 1873 continue the line was the illustrious Amurath 1881 "Weil" but he also sired some mares. 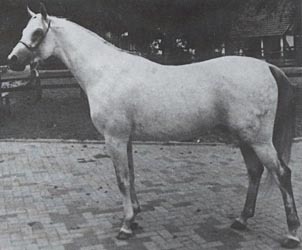 As mentioned before, Amurath 1881 was sold since he was closely related to the Weil mares. Before leaving Weil he sired the stallions Selim 1896 (imported to Poland) and Amurath 1892 (sire of Kalga, the dam of Kewa). Before Selim 1896 left Weil he sired the stallion Nana Sahib I 1907 who sired Sahiba and was thus maternal grandsire of Amurath Sahib. The other mare Nana Sahib I sired, Zorza Pelkinska 1930, also left offspring that survived WW II. Selim 1896 left only two get in Poland, one stallion not used in purebred breeding and a mare, Gazella I 1907, whose descendants were lost in World War II. The mares sired by Amurath 1881 at Weil were Amourette 1889, Sarah 1891, Sakuntala 1892, Sylphide I 1892 and Savona 1895. At Radautz he sired the stallions 35 Amurath II 1907 and Amurath III, both imported to Poland. 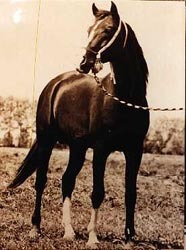 Most of their get was lost in WW II but Niespodzianka 1931 by 35 Amurath II and Bajka 1920 by Amurath III produced offspring that survived. Bajka 1920 was taken to Tersk in 1939 and produced one son by Hardy there but he was never used. 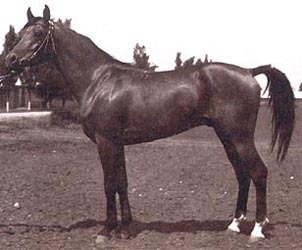 Amurath 1881 also sired several mares at Radautz, of which the most noted was Amurath 1901, the dam of Koalicja. In 1918 35 Amurath II was imported to Poland and used at Pelkinie and Breniow. 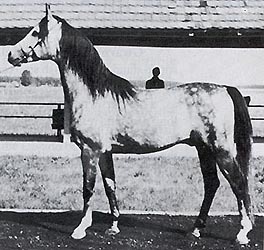 He was a light bay stallion and is described in "Seven Splendids" by Roman Pankiewicz (quote from W. Wnukowski): "... well proportioned and coupled with correct hindlegs. Endowed with plenty of beauty, type and refinement." None of his get at Pelkinie bred on but from Breniow Amurath Sahib survived the war and all horses of the Bairactar OA line on the male side today descend from him. Even though born in Poland, he was not of polish lines, his sire being of Weil/desert origin and his dam from Weil and Babolna blood. 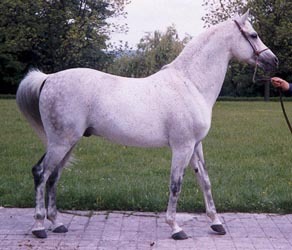 As a paranthesis, he was the last stallion of the Bairactar OA line to be considered "asil" by the Asil Club. Most horses recognized by the Asil Club are straight Egyptian and the group from Babolna carrying Amurath Sahib blood are a source of outcross blood for breeders within the Asil Club. This definition of "asil" stands for the Asil Club and the author of this article does not claim this definition. To know more, visit the Asil Club. Amurath Sahib left three sons and, true to his ancestors, many good broodmares. The sons were Arax out of Angara, Gwarny out of Gwara and Equifor out of Forta. Arax left only one foal crop in Poland before his exportation to Russia. His polish get did not include any son that bred on but some extraordinary mares, including Zlota Iwa and *Rokitka. Equifor left one son used in Poland, *Cedr 1958 out of *Cosmosa, and one son exported to Egypt, *Majdan 1958 out of Mufta. *Majdan was later exported to USA where he left some offspring. *Cedr was imported to Sweden and then exported to USA. He did not divert from his heritage either, leaving no son in Sweden but broodmares supreme *Maricedia (2x Amurath Sahib through her maternal grandsire Arax) and Cesa (also 2x Amurath Sahib as he was her maternal grandsire), founder of a dynasty at Blommeröd. In USA he left one son of note, Wielki Raz. 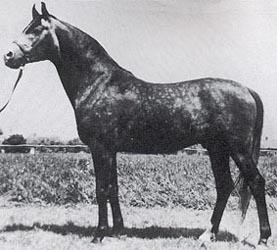 Gwarny 1953 out of Gwara was excellent as a sire and displayed the longevity of the line as he died at the age of 27. He was described as "a big horse, perfect in conformation, with a long neck and relatively handsome head". Six of his sons has been used at stud in Poland: Endor out of Engracja, *Gedymin out of Gastronomia, *Polonus out of Planeta, Argo out of Arba (not to be confused with the *Nabor son Argos), Pasat out of Parma and Balon out of Ballada. He also sired several stallions used outside Poland. Endor died early and left only a mare, *Kantata imported to Sweden. *Polonus was used for two seasons in Poland and left the mares *Doryna and Miniatura exp Germany. Argo was used a few seasons in Poland before being leased to Sweden. He left a stallion in his second foal crop, Falsyfikat out of Fantastka, who has also been leased to Sweden. Balon was leased to Sweden as well, where he has sired good offspring. 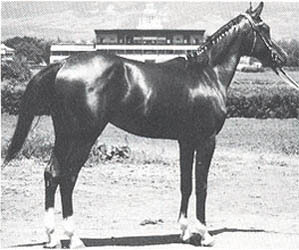 His dam Ballada was the last offpring from the legend Bandola. One son, *Falk out of Philippa, was exported to Canada. A son born in Poland, Elist out of Elewacja, is in the UK at Patricia Lindsays. *Falat was exported to USA but left no son. He was a 3/4 brother of Equifor as they had the same dam, Forta. 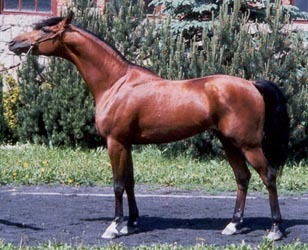 *Kirkor was a sucessful sire in USA. As he also was out of Carmen, he was a halfbrother to Comet. Among others he sired Brandie 1972 (dam of Brandie Aleksandra and Sonoma Lady), Jano 1970 (dam of BPL Ovation), Kirkors Gazal 1971 and Kirkors Karla 1972 (dam of western champions). This is very impressive considering that he died as early as 1972, at 11. *Perkoz out of *Pardwa was 1983 Canadian Top Ten AOTR English Pleasure and had several Western Pleasure championships. *Pasat was exported to Germany and then returned to Poland where he sired two foal crops. His german-bred son *Penthagonn was also used at stud in Poland and at Marbach, thus bringing back the Bairactar OA line to its original home. Abu Ali out of *Mimikra was an in-utero import to Blommeröd, Sweden. Used sparingly at stud, he sired some good mares. One son was used, Abu Alzar, but he was gelded after three offspring. In later years two Gwarny sons were discovered and imported to Sweden, Wirus and Emblemat. *Gedymin was used in Poland and then exported to USA. Despite few seasons at stud, he managed to sire some sons used at stud. His sons used in Poland were *Dylemat 1974 out of Doliwa (imp Sweden), Woroblin 1977 out of Warmia exp Brazil and Embargo 1975 out of Emilia (gelded). Outside Poland Dryl 1975 out of Daszawa was exported to Miss Patricia Lindsay, UK, *Wilczur 1977 out of Wilczura and *Estragon 1974 out of Eskapada went to USA. *Wilczur was gelded after siring a few offspring. He was a multiple performance champion in park and driving. 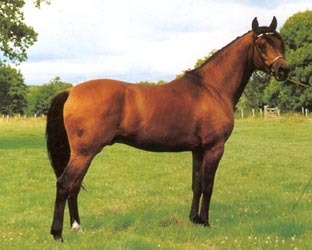 *Dylemat sired one son (while in Sweden) that has been used in Germany, Dynamito. Woroblin sired two sons used at stud, Omar in Sweden and Pengo in Germany. Embargo sired no son used in Europe but an in-utero export to USA, *Krakus el Kasyno, has been used at stud. It is impossible to talk about the Bairactar OA line without mentioning Russia. This is the only place where it has left numerous sires but that may not be so surprising. The stallion that took the line to Russia, Arax by Amurath Sahib out of Angara, reminded more of his dam's ancestry rather than that of his sire. Nevertheless, he was a great success as a sire and added refinement to the russian horses pre-Aswan. 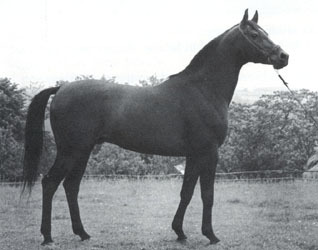 His son Nabeg closely resembled him and was also a great sire. Beside Nabeg he sired a few stallions used in Russia but they were in no way the success Nabeg was. The others were *Namek out of Neposeda (used at Tersk, exported to Germany and then to USA), Paris out of Panel and Premer out of Privilegia. Other Arax sons were used outside Russia, some with more success than others. Some of the more successful were *Tamerlan out Trapecia and *Naivnyi out of Norka in USA, *Nasmeshnik out of Neposeda (later exp USA) and Pamir out of Piramida in UK, Parsek out of Privilegia in Germany and Pirs out of Platina in the Netherlands. Many of the russian horses exported to USA have offspring in Europe because of the piroplasmosis check and if necessary treatment that has to be done before the horse leaves for USA. Unfortunately, many horses die from this treatment or get ugly scars. Arax himself was exported to the Netherlands as an aged horse but died shortly after his arrival there. The Nabeg son to have the most influence in Poland is Tallin. A very handsome horse himself, he has also sired beautiful horses. His son *Wojslaw has been used at stud but Tallin left mainly a lot of beautiful daughters who have been very successful as broodmares. The supersire *Menes travelled a lot in his days. First used in Russia, then to the Netherlands for piro treatment, over the ocean to USA and finally back to Europe. Some horses in Poland carries his blood, mainly at private studs. At Tersk *Menes sired Balaton who became a show star in Europe and sired Kubinec (whose blood also can be found at private studs in Poland), the current "superhorse" in Europe. Nabeg (and *Menes and Balaton as well) sired many other influential horses but as this article focuses on polish horses, that will have to be another article!